Both prokaryotes and eukaryotes perform fundamentally the same process of transcription, with the important difference of the membrane-bound nucleus in eukaryotes. With the genes bound in the nucleus, transcription occurs in the nucleus of the cell and the mRNA transcript must be transported to the cytoplasm. The prokaryotes, which include bacteria and archaea, lack membrane-bound nuclei and other organelles, and transcription occurs in the cytoplasm of the cell. Transcription requires the DNA double helix to partially unwind in the region of mRNA synthesis. The DNA sequence onto which the proteins and enzymes involved in transcription bind to initiate the process is called a promoter. In most cases, promoters exist upstream of the genes they regulate. The specific sequence of a promoter is very important because it determines whether the corresponding gene is transcribed all of the time, some of the time, or hardly at all. Figure 2: The initiation of transcription begins when DNA is unwound, forming a transcription bubble. Enzymes and other proteins involved in transcription bind at the promoter. 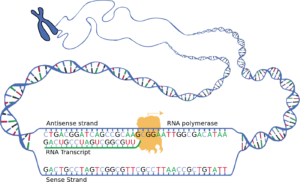 Transcription always proceeds from one of the two DNA strands, which is called the template strand. The mRNA product is complementary to the template strand and is almost identical to the other DNA strand, called the non-template strand, with the exception that RNA contains a uracil (U) in place of the thymine (T) found in DNA. An enzyme called RNA polymerase proceeds along the DNA template adding nucleotides by base pairing with the DNA template in a manner similar to DNA replication. Figure 3: During elongation, RNA polymerase tracks along the DNA template, synthesizes mRNA in the 5′ to 3′ direction, and unwinds then rewinds the DNA as it is read. Once a gene is transcribed, the RNA polymerase needs to be instructed to dissociate from the DNA template and liberate the newly made mRNA. In a prokaryotic cell, by the time transcription ends, the transcript would already have been used to begin making copies of the encoded protein because the processes of transcription and translation can occur at the same time since both occur in the cytoplasm (Figure 4). In contrast, transcription and translation cannot occur simultaneously in eukaryotic cells since transcription occurs inside the nucleus and translation occurs outside in the cytoplasm. Figure 4: Multiple polymerases can transcribe a single bacterial gene while numerous ribosomes concurrently translate the mRNA transcripts into polypeptides. In this way, a specific protein can rapidly reach a high concentration in the bacterial cell. Previous: 6.2 How do genes direct the production of proteins?